IHRB believes in ethnic advertising, reaching consumers from Arabic to Chinese backgrounds. Here we have samples of the Thai ads that appeared in ‘VR Thai Magazine’. All the same unlawful, misleading, and unverified promises, with a dozen breaches as Determined by the Complaints Resolution Panel. Below is the masthead for ‘VR Thai Magazine’. Below is one of several Thai ads that featured my name, wherein Sam Cohen was telling the world that I was lying. Of course, I responded to his desperate allegations in this separate article. Below is yet another version of the same set of unlawful and misleading ads that have been officially found to contain claims that are unverified, and which are guilty of 12 breaches! Here is yet another version in Thai. 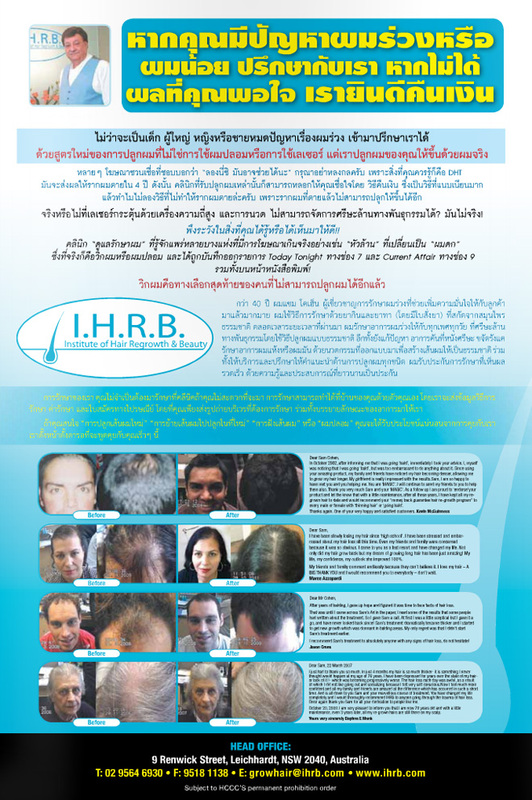 As at 10 March 2012, this hyperlinked thumbnail ad appeared on VR Thai’s home page. The ad links to IHRB’s website, which was (at 10 March 2012) 116 days in breach of CRP Sanctions. More information about the days-in-breach can be found here.